It was exactly one year ago that Mirror Friendly was unveiled and brought to life. The period between the 13th December 2013 and today has been an intense journey of hard work to provide each one of you, my esteemed followers, with regular and relevant content about fitness, nutrition and healthy living. A priceless journey which I literally loved and which I wouldn’t exchange for anything. 2014 was also the year which saw me rise to the top of Men’s Physique in Malta and battle out with the best physiques in Europe. For this I am very grateful. Furthermore the feedback I have been receiving has been outstanding and beyond my expectations. The considerable traffic on this website and the Mirror Friendly social pages confirm this as each day brings with it new followers from the 4 corners of the world. However no man is an island. Just like a talented athlete cannot perform at his/her best without a proper system of support (e.g. 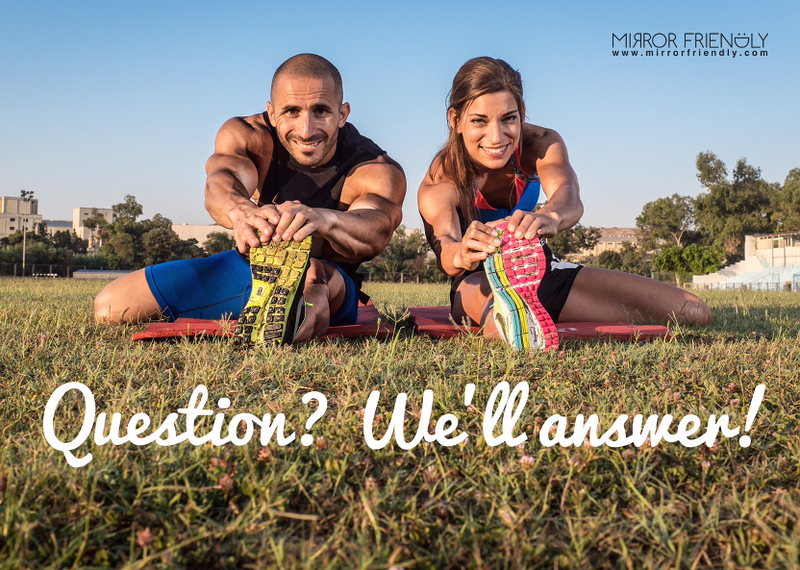 coach, training facilities, masseurs, physio, mentors, sponsors) the Mirror Friendly concept cannot be self-supportive if it wants to continue providing the best content to its community of followers. In fact during the past months I’ve been supported by my Toronto-based cousin, Tanya, who has been pooling in excellent quality articles reflecting the true values of Mirror Friendly. From here I would like to thank her publicly for her regular input to the this cause and I look forward to share more of her knowledge with you. Ladies & gentlemen… Here’s to you. Martina is a 27 year old young lady from Slovakia. Martina is a qualified nutritionist with a Masters in Human Nutrition obtained at the University of Nitra, Slovakia. Martina is a qualified fitness instructor from the Australian College of Sports & Fitness in Melbourne, Australia. Martina is a proud health freak in that she works out 6 times a week at the gym and leads a very healthy lifestyle. During the past year Martina has been the brain behind many of my posts. She was the lightbulb while writing nutrition articles, the click behind my camera, the careful chef preparing our recipes and my right hand along the way. For all these reasons I believe Martina brilliantly embodies Mirror Friendly and from today she will be carrying it with her wherever she goes. Having said so, you should know that Martina’s claim to fame was not all rosy. Today I would like to spend a few words to share with you how she managed to earn my trust and her chair on the Mirror Friendly team. Martina and I met one Maltese summer night in August 2012. At the time we met, Martina was already 3 years down her Masters in nutrition and with 2 years to go her knowledge with respect to healthy eating was already top notch. She also led an active lifestyle regularly attending aerobic and Zumba classes. However the one problem she was facing on a daily basis was a lack of discipline with food, which might sound ironic considering her studies. Since nutrition is extremely important in how one looks, Martina’s weakness with food was the reason why she was not happy with the way her body looked. To be clear, Martina was not overweight but she was struggling with achieving a lean and toned physique. When she returned back to Slovakia at the end of that summer we agreed to keep in touch via Skype, where our discussions were somehow always led towards nutrition and healthy living. She now says that back then somewhere along the line I had motivated her to take on weight training at the gym (I did it my way!) and needless to say I was very keen in guiding her with training programs and motivating her willpower to keep her diet in check. It only took a few consistent months at the gym for Martina to make her first leaps towards the main 2 goals on her list i.e. cutting down fat and gaining muscle tone. However, due to the distance between us these gains could not reach their maximum potential since I could not follow her as closely as I would have liked. In fact at some point Martina reached a plateau and she was struggling with making further improvements. Unfortunately not much could be done since priorities required that she finished her studies before making a move to Malta. A move which materialised in June 2014, a few weeks after Martina obtained her Masters with distinction. The very day she moved to Malta I enrolled her to the same gym where I train and from here onwards we did our workouts together. Martina’s work ethic and the serious way she took on our workouts meant I had found the ideal training partner who not only had the same mindframe but could also enhance my knowledge in nutrition. In return I helped her apply this knowledge to come up with a proper sustainable diet while in the background I continued fueling her motivation. Nowadays Martina’s discipline with food has become rock solid and she follows a very healthy lifestyle. This coupled with her nutrition wikibrain and her newly found passion for fitness has led her to achieve the body she always wanted but never really believed she could have. Having said so, Martina didn’t stop here. In March 2016 after spending 7 months in Melbourne, Australia, Martina obtained her certification as a fitness instructor and to date continues chasing gains. Girls take note, with weights Martina DID NOT become huge or manly but she became fit, lean and toned. She did not revert to silly slimming treatments, nor did she let herself fall for gimmicks. No fat burners, no shortcuts. All she did was focus on her lifestyle and improved on it. …and when she thought she could not improve further and felt like giving up, I pushed her forward and motivated her to dig deeper. Martina is living proof that where there’s a will there’s a way. During the past few years I have realised that motivating outsiders is much more easy than motivating people who are close to you, as was the case with Martina once she had reached a plateau and started to lose heart. However her transformation has in this sense also taught me that patience and perseverance in what you believe can also break through the hardest of nuts. Martina is a source of pride and I consider her the prime Mirror Friendly certificate. From today, she is Mirror Friendly. Congratulations! Very interesting article and incredible transformation photos! 🙂 Martina is amazing! Would love to look as good as she does! 🙂 Thanks for sharing this guys! Welcome aboard Martina! I look forward to your articles. Well done, Martinka! Very proud of you!!! Keep up the good work. Thank you Andrew for such an inspirational article, I wish you both courage & persistence all the way! Ďakujem. Veľmi si to cením. Hello and welcome to Mirror Friendly! I am Andrew from the Mediterranean island of Malta and fitness is the biggest passion of my life. I am an ex national sprinter turned natural physique athlete and an anti-doping ambassador for my country. Professionally, apart from being a qualified personal trainer, I am an accountant holding the role of COO in a listed company. I am here to share my journey through healthy living while educating and inspiring people from different spheres of life, regardless of their fitness level, including you! My right hand on this journey is my Slovak sidekick Martina. Apart from being a registered nutritionist with a Masters in Human Nutrition and a qualified Fitness Instructor, I consider Martina to be the best certificate of Mirror Friendly. Furthermore my team wouldn't be complete without my cousin Tanya, a registered Holistic Nutritionist & fitness aficionado based in Toronto, Canada. Tanya plays a vital role in the Mirror Friendly mission by writing quality articles which you can find on this website. The Mirror Friendly lifestyle seeks to continually create a better version of oneself: physically, but also mentally and spiritually. Put simply, being Mirror Friendly consists of being healthy and owning the body you desire but also living a happy life and being at peace with yourself and the others. Apart from this website which is regularly updated with new content, you can also stay Mirror Friendly through Facebook, Instagram, Twitter and YouTube. Disclaimer: Before performing any of our exercises or apply any of our nutritional advice, you should always consult your doctor/physician. Your personal health and safety is our concern. Get your personalised nutrition plan and training program today! Design your Mirror Friendly vest now and receive it home!